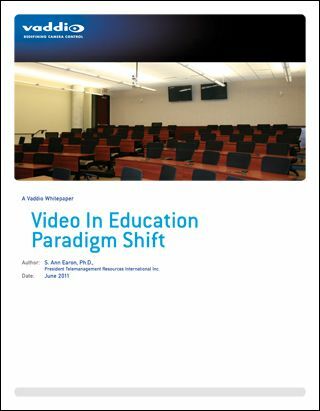 Minneapolis, MN--Vaddio has released a new white paper authored by S. Ann Earon, Ph.D., "Video in Education Paradigm Shift," which examines how the distribution of content is changing the way information is accessed, and how to make the best use of video technologies to engage students. According to the white paper: "Building a consistent front end will allow schools, colleges and universities to teach from a consistent platform. The "back end", or engine, may change with new innovation. The objective is to understand that a consistent high-tech classroom can remain and grow. Tracking cameras for instructors, student cameras and touch-to-talk microphones for remote students, video whiteboards, high definition document cameras, and fully integrated computers will drive the content and make it easier to communicate. The paradigm is changing. Classrooms and training rooms are becoming an important part of the decision process for CIOs and IT departments. Building a consistent and easy-to-use front end will allow students and educators to benefit from changes in technology, with only the back end components needing change. Distance learning, streaming, recording, distribution via web links are all readily available technologies. The engines will change and grow, but the consistency of the front end classroom will remain the single most important piece of the solution. Carefully selecting, quality front end products will allow organizations to cost effectively reap the benefits of video communications for many years without the need to constantly change all aspects of technology as the engines change."